Here’s the next 3 groups, just do like you did before read through the countries of each group then select 2 countries in the polls of each group who you want to advance to the knockout stage. The only historical eruptions in Argentina took place on the Tromen and Viedma volcanoes during 1822 and 1988 respectively. However, Argentina does have a few good looking volcanoes notably El Condor, Peinado, and Payun Matru, etc. Eruption of Holuhraun. SOURCE: Photovolcanica. Virtually everyone loves good old Iceland which is well known and sits atop the Mid Atlantic Ridge making it one of the most volcanically active places on Earth with no shortage of volcanoes and volcanism. Notable volcanoes include Eyjafjallajokull, Hekla, Katla, Surtsey, Eldfell, and Krafla. Basalt columns of Rupnica. SOURCE: Wikipedia. No volcanoes in Croatia but the next best thing is the basalt columns of Rupnica and the offshore islands of Jabuka and Brusnik, both of which are of volcanic origin. Not much for Nigeria but there are some extinct volcanic cones in the Biu Plateau and another volcanic region which goes by the name of Jos Plateau. Pico do Cabugi. SOURCE: Wikipedia. None of the Brazilian volcanoes have been active during historical times but we have the island of Trindade which lies in the mid Atlantic Ocean and also the well preserved cone of extinct volcano Pico do Cabugi on the mainland. No volcanoes in this mountainous central European country and a tough one to find volcanism. However, some remnants of ancient volcanism appear at the surface especially in the form of volcanogenic sedimentary deposits and Mafic dyke swarms. A volcanic powerhouse this Central American country hosts a nice selection of volcanoes especially the historically active Rincon de la Vieja, Miravalles, Arenal, Poas, Irazu, and Turrialba volcanoes. Arenal was in a constant state of eruption from 1968 till 2010, Irazu last erupted in 1994, but the most recently active volcanoes are Rincon de la Vieja, Poas, and Turrialba. No volcanoes for Serbia but evidence for volcanism can be found in the form of alkaline basalts in eastern Serbia and the Timok Magmatic Complex which is associated with subduction during the Late Cretaceous to Paleocene era. Eifel Maar lakes. SOURCE: Wikimedia Commons. The best known place in Germany for volcanism is the Eifel volcanic region which contains a series of maars and pyroclastic cones. The last eruption came in the early Holocene era. There are some much older volcanoes in central Germany, east of Frankfurt. There are plentiful volcanoes in Mexico so we will focus on the historically active ones. First we have the islands of Barcena and Socorro offshore in the Pacific which had their eruptions in 1953 and 1994 respectively, then we have Mexico’s highest point Pico de Orizaba last erupted 1846. But a famous eruption came from Paricutin, a cinder cone which rose and grew from a cornfield in Michoacan during 1943-1952. We also can’t forget the big 1982 eruption of El Chichon when the explosion blew the lava dome to pieces and left behind a 1km wide crater. Other historically active volcanoes in Mexico are Ceboruco, San Martin, and Tacana, but the big boys are Colima and Popocatepetl which are two of Mexico’s most active volcanoes. Sweden has no volcanoes but the next best thing comes from the Central Skane Volcanic Province, evidence for Jurassic era volcanism. Over a hundred basaltic volcanic necks are present suggesting there was once a cinder cone field there, and not forgetting the basalt columns. Representing South Korea we have Ulreung which is located on the island of Ullung in the Sea of Japan, an eroded stratovolcano which hasn’t erupted during historical times. And we have Halla which is located on Cheju island to the south of the Korean peninsula. Historical eruptions of Halla came in the years 1002 and 1007. Polls will close on the 20th June. Mostly a no-brainer this time! Absolutely, I was out when the match was on so I recorded it to watch when I got home and I was absolutely amazed. It’s funny, I’m English and come from a family that traditionally supports Scotland, but I always support Iceland in the football – it makes for some interesting rivalry haha. It seems to me that the entire area should have new housing banned and existing householders should be encouraged to leave. That is virtually the entire area in your photograph. This will ensure the next big breakout will be elsewhere …. One of the local politicians has proposed and recieved a lot of support for lava hazard zone 1 no longer allowing building. This means any houses already there can stay but the lost houses can’t be rebuilt on the 2018 lava after the eruption ends and any that do will be illegitimate. There is a plan to move them to an empty area north of Pahoa. I hope the lava field is made into some sort of accessible area, I think with all the coverage of the eruption and how big the cone is now, people (including me) will want to see it in real life to get a sense of the scale. Most of the 1955 and 1960 cones have been quarried but this vent might stay because a lot more people (probably the large majority) now respect the traditional culture and would like to preserve the landscape created, and even if that isnt a main reason, the cone and surrounding lava field is like a monument and at least a reminder that something happened there once. Highways will have to be rebuilt and probably also some of PGV, but the rest of the place will be left as it is. This may only be the known housing. There were a lot of people living in houses build without permission, and a lot of people living there unregistered. More than half the legal houses were second homes or holiday homes. Look at the flow now from Fissure 8! Fissure 8 pumping out some serious lava. Never seen lava move this fast! CLICK HD! That is impressive, not to say bizarre! First thought it was fake till i saw the folks move in front of the flow at normal speed. This sounds pretty significant as the fountain has stayed pretty low up until now, but if it starts getting bigger (as seems to happen quite often during eruptions from kilauea), then the cone will also get bigger but in the process it will probably render a lot of places not currently buried by lava uninhabitable too. Holy cow. No one could out run that. Lots more new land going to be made when it hits the water. Well, Kapoho bay is essentially already gone. Ken Boyer filmed it while on an evacuation/rescue missions. He’s done a follow-up video where he talks about the day https://www.facebook.com/K.BryanHI/videos/1972561786110233/ including filming that flow. There’s a few people in the area still doing regular excellent facebook video updates and he’s one of them. ApauHawaiiTours also does videos of it on youtube, although his vids are more based around the cone rather than the lava flow. This could be a duplicate of something getting moldy in the dungeon. The EQs have been steadily increasing, and moving more to the center of the caldera and also to the south. The following comment on the event was supposedly made by Tina Neil USGS head of HVO at a local meeting on Thursday evening as reported by “The View Master” on twitter. His tweet history shows him to be usually reliable. The #KilaueaVolcano #HalemaumauCrater Volcanic ‘Steam Driven’ Explosion Theory Is Being Allowed To “Lapse”! In It’s Place, Is The Idea Of ‘Volcanic Gases’ Driven Explosions, As There Doesn’t Appear Enough Interaction With “Water” To Call Them Volcanic ‘Steam’ Explosions! From 1983 to 1989, Neal lived in Volcano, and worked on the staff at HVO. Her work included monitoring Kīlauea Volcano during the early years of its ongoing East Rift Zone eruption, as well as Mauna Loa during its 1984 eruption. She fondly recalls one day in March 1984, when she spent the morning working atop the erupting Mauna Loa and the afternoon collecting lava samples from the active Pu‘u ‘Ō‘ō vent on Kīlauea. For a volcanologist, simultaneous eruptions on two volcanoes made for an unforgettable workday. Well, if the prevailing idea moves to the volcanic gas driven origin, that brings the Mastin et al formula back into play to estimate the mass ejection rate. It also makes the potential level of energy release much highet. Also good to know that I wasn’t just making it up when I read the first article about how these eruptions aren’t steam driven. I admit I did struggle to see how enough water could have got in the right place and the right depth for a phreatic eruption, but I never got round to asking. In this case the system has been under extreme pressure for years (at depth) as is clear from the lava lake. so deep down the lava is likely saturated. Remove even a few hundred meters of lava and there will be a ‘significant’ pressure drop. If gas at depth manages to precipitate out then the lava density in the column decreases, further reducing pressure so more vapour precipitates out and …. … And you get a massive lava fountain going 500-1500 meters high (which should be called an ultrastrombolian eruption), or a full blown plinian eruption. Eruptions exactly like this happened many times when the two most recent calderas were really deep. The last eruption of this type predates historical observations by less than a decade… 1959 might be a borderline case too. Mr le strange and Lurking, the river of lava is eroding rock at a good rate is it not? The real estate is fluid. “Scour” … and not even needing an abrasive agent suspended in a fluid. The agent is the fluid. Am I correct in saying, the fountain will be less and the flow will be more due to widening of the conduit? Except if more gas or water is added of course. That lava “river” flow is stunning, I would love to know how deep it cuts into the existing surface after this is all over. May be it will crust over and form a tube as it comes to an end. Russel it wont cut into the existing surface unless that surface is made of porous loose ash, and it has to have a slope anyway which there isn’t much of where it is flowing now. The lava forms channels because the edges cool down while the middle is hotter and moves faster so it stays liquid. In theory yes the fountain will decrease in height as the conduit gets wider (holuhraun is a perfect example), but that hasn’t happened yet and probably isn’t going to happen. The fountain is still the same size as before (about 70 meters), the cinder cone is just way bigger than before. It was 35 meters tall a few days ago and now it is more than 50 meters tall and and 250 meters wide, it is growing fast. Most of the pre-existing named cones in this area are about 40-70 meters tall so this is about right. I am just trying to explain that river to my brain. Liquid rock is harder to get a mental picture of, than water rivers. Lava flows dont erode the ground they flow over unless the flow is active for a really long time and is in a lava tube. The only way you get flows eroding the durface underneath to any real extent is if the subsurface is made of tephra. There is a gully in kilauea caldera that lava did this in during the 1971 and 1974 eruptions. Yeah just saw that little bang when I rewound the live stream. The movement of the crater wall when it goes really is noticeable. I also saw some footage of the cinder cone around fissure 8 on the latest civil defence update video on Big Island News’ Youtube channel. Just a few moments of it, but it really does show how rapidly that is growing. Predictably the comments are replete with idiots saying a “new volcano” is forming, plus the usual doom of the Lord weirdos. There was even one I saw a few days ago claiming that FEMA is using barges offshore to make people disappear! The degassing at the summit is pretty substantial, although without a lava lake still less than before this began. There are going to be an awful lot of scientific papers dedicated to this eruption over the next few years. If you live in Alaska, and even more if you live in Anchorage, an interest in volcanoes is hardly unconventional, or shouldn’t be..How many different volcanoes have dusted the city with ash? Three, or maybe four? “Doomsayers?” Here? Not hardly. More astounded than doomy. Back-of-the-envelope calculations for the kinetic energy in that high speed magma flow is what is astonishing. Upwards of 155 kJ per cubic meter or so. Really long freight trains don’t come anywhere close to that in kinetic energy. Fernndina in the Galapagos is erupting again, that’s twice in 9 months. Now there are two ocean entries into the pacific. I don’t know how far the vents actually are from the ocean but that lava flow must have been moving really fast to get to the ocean before observations started. The eruption is on the north side of the volcano too, not the south side like the other recent eruptions, and the flow seems to have reached the ocean in less than an hour. It looks like a similar situation to the 2009 eruption but on the opposite side of the volcano. It looks like there are lava fountains probably 100 meters tall along most of the lower fissure. A ‘moderate eruption’ there is in the same size range as the eruption on mauna loa in 1950 so this is a volcano that really needs to be monitored. From Honolulu Civil Beat about an hour ago. I took a screenshot of that spot on google maps before the flow was there, or at least where I think that spot is. Google maps has a different field of view so it is hard to see that dip in the road. And for reference, here are a few frames snagged from a related video. It passes the “sniff test” and seems quite authentic. Notice that the high speed flow is bordered by progressively slower flow streams next to it as it approaches the edge. That’s laminar flow. I don’t think many movie franchises feature that level of detail in their special effects. Thank you lurk, not a twitter or a facebook so I can actually see it!. Pretty damn impressive it is too. Thanks for your link to Laminar flow I am a long time member/lurker. I will pass this explanation on to some residents that have been reporting an increase in the speed of the lava river in the last few days. They are astonished by it and so am I. I will drop the explanation in their comment sections on FB and YT. The photo journalist that captured this used a top of the line gear and lenses. I follow his work and he is very well respected internationally. I also enjoy all your stories because I used to live in Gulf Breeze. I have learned so much from all of you. Here’s an official civil defence message video from a couple of hours ago. The fast flow can be seen from 0:41 to 0:53, and 1:16 to the end. Looks like someone got dangerously close to film it. It doesn’t look quite as fast as before. Ikaika marzo has a couple of very recent night videos showing the flow at times near the fissure, and saying that it is about 35mph. For both Kilauea explosions over the past days, the tilt meter at Pu’u’O’o showed a sudden drop of a less than 0.5 microrad, an hour or so before the explosion. I saw the drop yesterday and though ‘keep an eye on this’ – and indeed.. The funny thing is that there isn’t such a clear precursor at Kilauea itself. It suggests the possibility speculation alert that the explosions are triggered from the rift, not the caldera. Perhaps the level drops so far that the top of rifts dries, lack of pressure causes sudden increase in volatiles and the wave makes it way back to the caldera… this is complete guess work, obviously. And in the monitoring page of https://volcanoes.usgs.gov/volcanoes/kilauea/monitoring_deformation.html, HVO has added the NPIT GPS. Now you can see the caldera collapse in real time. Wow. It may be speculation, but it makes sense. I dont think it has a high chance of surviving this event. If there is a really big drop then we know what happened. How would the explosions be triggered from the rift? If I understand Alberts idea correctly… as the magma level in the top of the rift area runs “dry” it leaves an unpressurized surface above the magma that then invokes vigorous degassing. Like any natural process, it is prone to overshooting in pressure as more gas exolves than can occupy the availible space. When this pressure pulse occurs, it travels back up the weakest path, that being the areas of the conduit that are not blocked by magma, meaning towards the summit vent at the base of the now empty caldera. The higher viscosity of the magma down rift has many of orders of magnitude greater inertia than the near empty vent to the rift, so the pressure pulse heads for the summit. Caveat, this is just my interpretation of what Albert has infered. I might be incorrect, and as Albert stated, it’s just an idea. Second to last sentence should read “to the summit” instead of “to the rift”. And if that confuses you (I’m still confused), just drop a mentos into a liter jug of fresh soda and you will get a first hand demonstration of the process as the number of available CO2 nucleation points rapidly increase. Side note. Sparks has made a similar observation about bubble nucleation undergoing a runaway process in explosive activity in his preface to a book on the topic. Ultimately Sparks equated it to a sigmoid curve’s behavior as a system avalanches from one relatively stable state to another. Interestingly, sigmoid curve behavior can be found in many natural systems.. including in neuron behavior as the synapse transitions to an “on” state when a signal passes through. The gist of how the curve behaves, is that as the triggering parameter approaches the other state, nothing much changes until a critical point in the curve, then the amount of change in the system state radically cascades to the new stable state. Another related, (though I’m not really clear who originated it) idea that I’ve seen kicked around here on VC, is that as a dike progresses through strata, a series of mode 1 failures occur in the rock at the tip of the dike. As the space in front of the finger of magma becomes empty, the entrained gas exsolves and hammers the crack wider and the magma then flows into the new void. I know Albert has ruminated on the idea, the gas hammering the crack wider is sort of his idea, I know that much. My only contribution to the process comes from what I have read in a book on caldera formation that noted the “Hoop strength” of the chamber wall is dependent on depth (lithostatic stress) which makes the preferred fracture direction point towards the surface where there is less confining stress. But it proved inconsistent and certainly wasn’t seen prior to every, or indeed most, summit events. So, Pele prefers green gems. To match her eyes or to complement her hair? The start of this event appears to be back in mid-March, when Puʻu ʻŌʻō embarked on an abrupt and significant inflation. What’s interesting to me is that similar episodes started almost exactly two, and four, years ago. They didn’t proceed to the kind of inflation seen prior to the onset of this episode; they petered out. Why? Does the inflation relate to a change in magma inflow into the system? Or to internal ‘constipation’ at Puʻu ʻŌʻō, and restricted (or in this case, terminated) magma outflow to the 61G eruptive vents? A post mortem will some day tell us, I hope. Either way, the system pressurized to a degree that hasn’t been seen before, at least in the last 5 years. Pu’u o’o was basically just a dam against magma flowing out of the east rift, so when it broke, that is where it started but not where most of the magma came from. The eruption has so far not erupted summit derived magma which suggests that there is (or was) a lot of magma in the east rift that is feeding this, with a lot of it probably coming from the area just uprift of pu’u o’o near napau and makaopuhi craters. The magma from the summit is chemically the same as pu’u o’o magma, but it will be hotter and more gas rich, so the difference will be noticeable. The summit has drained out into the east rift as would be expected but as Alberts comment suggests, it isn’t getting to pu’u o’o as fast as the eruption is draining the area, meaning the summit isnt really directly feeding the eruption at all and so when summit magma erupts, the eruption rate might actually decrease a lot but the fountains will be higher, possibly a lot higher. After that it will probably stop quite soon as the pressure shuts off the conduit. Further eruptions are possible but wont be very big or long lived. This is also one of the main reasons why I favor the theory that the summit collapse isnt a direct correlation to the eruption itself and more a result of the former conduit to the overlook vent collapsing and filling in with the actual magma chamber being relatively unaffected in the long run. I guess none of that actually really answers your question, but I will answer it now by saying that yes pu’u o’o started it, but it wasn’t the ‘trigger’. The trigger was the increase in supply that pressurized the whole system. The increase started with pu’u o’o slowing down with a routine inflation which was going to eventually be followed by a vent collapse and breakout like in 2011, 2014 and 2016, with all of these being preceded by relatively higher lake level than before. However while that was happening there was also a surge in magma supply which filled the summit lake to overflowing at high rate, and this built up way more pressure at pu’u o’o that had no vents large enough to be released through. Eventually the rift gave way and we all know what happened from there. 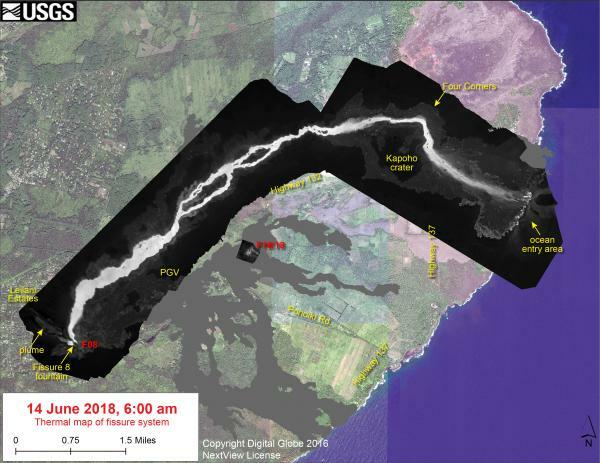 The surge was probably what caused the earthquakes under Pahala last year, and it finally reached the volcano in late April. These quakes are still going so this isn’t over yet. Some others will probably have their own ideas but this is what I think happened. Sorry but in an extreme rush. Do you have a definitive source for that? Which is kinda what I was thinking of; that was the ‘key log’ in this jam. The summit lake overflow wasn’t markedly different in size or duration to previous episodes – but the inflation at Puʻu ʻŌʻō most certainly was. The ‘coupling’ there seems weak to me. Source is HVO, I have watched videos of people who ask the geologists if summit magma has erupted and they say no. The last one was a while ago but nothing has changed at all since then so I doubt the summit magma has started erupting unnoticed. As said before, the summit magma will be slightly hotter and have more gas in it than the lava at pu’u o’o. This will result in higher fountains which have not been observed yet. This stage, if it happens at all, will be quite brief though as the evidence from pu’u o’o suggests that the summit isn’t draining as fast as the eruption is occurring, so the eruption will gain a higher fountain but the actual eruption rate will decrease probably by a significant amount which increases the chance of the magma solidifying in the conduit and stopping the eruption. 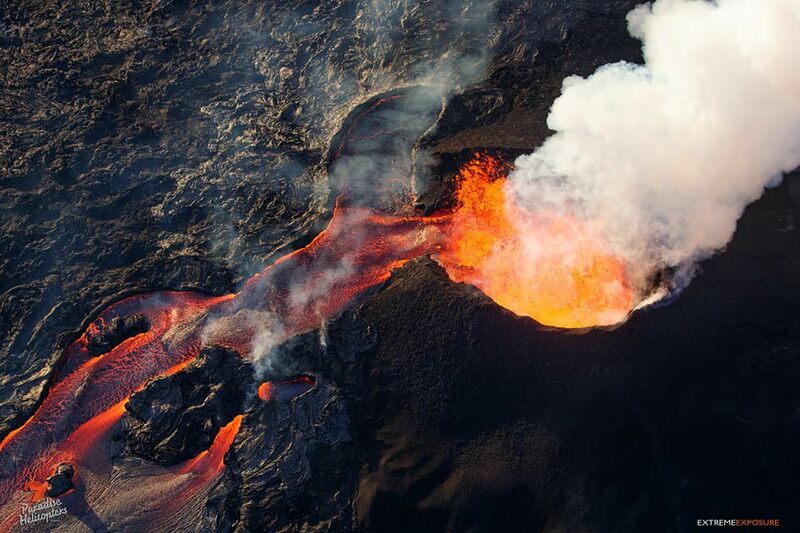 The lower eruption rate with higher fountaining will cause the cinder cone to grow rapidly from the fallout but the flow to the ocean will die and lava will probably just spread out around the vent. I think 1960 did this too, up to that point it was similar to the current eruption. In this sort of activity some of the flows will probably go over the south edge of the rift as well as the parts of leilani that aren’t touched now, so people shouldn’t think their house is fine because their houses are in these spots. Until the eruption stops for good, anything can happen. 3-4 days ago they said SO2 emissions had markedly increased in LERZ and I believe they attributed that to increased eruption rate – but I’m not aware of the specific ‘summit lava’ question having being asked or answered at that time. This was stated by HVO some time ago (weeks?). It is probably out of date information by now. The linear deflation at Pu’u’O’o suggests the Kilauea magma isn’t going there, but there are not enough GPS’s on-line to know where it is. I think it is south of Pu’u’O’o. The increase in gas emission at Leilani may well indicate it has arrived there. but it won’t be pure; it will have mixed on the way, I expect. The question is more about what fraction of the erupting magma is from Kilauea. Albert this map might be of use to you. That link doesn’t show, I’m afraid. I know you posted a link in the comment but it is edited out by WP. If the magma isn’t draining out at the eruption rate, then the amount of magma that has actually left the summit is also much less than the volume of the eruption and hence the collapse is relatively shallow (the most likely option). Even assuming all of this eruption has been fed in equilibrium with the summit (which we know it isnt), the volume of magma in kilaueas system is about 100 times what this eruption has produced and the supply from depth hasnt decreased so it is still recieving magma, just not as fast as it is moving out, so this eruption very likely isnt going to have a really massive impact on the behavior of kilauea beyond this next few years. There has also been no deflation of the deep feeder system at all which happened in 1924, which indicates that the 1924 intrusion was deeper in the volcano than the current one. The current eruption seems to have more in common with the 1960 eruption but with way more magma available from the east rift allowing it to be much bigger. As such it is very unlikely that the volcano has been significantly depressurized to the point where it will go dormant like it did in after 1924 and will instead continue to erupt as normal, though probably not much for a year or two as the upper system reforms. The next eruption will probably be at the summit along a fissure trending southwest within halemaumau, possibly extending to the southwest rift or kilauea iki, and will likely be a brief event lasting a few days or less but followed not long after by another eruption and eventually a rather bigger eruption will happen and start properly filling the new crater. Im going to bet that the next eruption will be between December of this year and March next year. Given that the amount of magma under pu’u o’o probably isnt a massive amount, this eruption might start declining quite soon, and the eruptions will probably become more strombolian in character and build up the cone a bit while the lava flow dies down and stagnates. This happened in 1960 quite suddenly and it went from fully erupting to explosive lava jetting, ash emission, and then it stopped, all in less than a week. This sudden transition from low lava fountains with high eruption rates to a much higher jetting of lava particles with low total eruption rate might be a hazard to people nearby and could happen with little warning. I want to drop some ideas here. The first is Pu’u’o’o gradually evolving through its eruption with a shield growing taller and larger and a reservoir that needs to pressurize more to rise the magma to the surface. An aproximately 1 km deep or less reservoir has maybe been developing gradually by enlarging the conduit (The one that collapsed. I also think that the intrusion may have evolved from an active intrusion caused by magma forcefully intruding from Pu’u’o’o to a passive intrusion after the 6.9 earthquake were an irreversible displacement of the south flank has taken place very fast and the only pressure needed for the magma to reach the vent is the one necessary to rise the it to that height and leading to a very stable emission of lava. So like what happened in 1986 but much deeper in the rift zone? Yes, but downrift and at fast rates that the magma reservoirs from the summit and the ERZ cant sustain for long. I base my ideas in the past behaviour of Kilauea with episodes of high activity at the EZR, repeated pit crater collapse events, eruptions at Lower Puna and summit-SRWZ effusion periods. I think the cause for the pit crater collapses are large eruptions like the two that are very probably bigger than 1840 in terms of volume:1790 flows and Puu Kaliu, maybe Puu Honualua is a good candidate too. These eruptions have been large enough to drain the ERZ and so maybe are responsible for a return to activity to the summit. This eruption if keeping its steady rate then would be capable of producing something similar. I think the combined volume of the Napau and Makaopuhi East reservoirs before collapse was of 0.4 km³ but those two were the larger ones and maybe they didnt even form at the same time, so maybe a volume of 0.2 km³ is enough to disrupt the ERZ for some time and leave craters behind. The eruption rate that has been reported be HVO means the current eruption now has a volume of 0.2 km3 at an absolute minimum from fissure 8 alone, and another 50-90 million from the rest of the vents, so this is definitely in that size range. 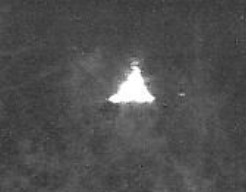 I don’t think pu’u honuaula is as big as this eruption though, probably more like 1960 in size (0.1 – 0.15 km3), the name only seems to apply to the single cone that the webcam is on so the ridge behind it probably existed before that. I remember reading something that said a flow from it underlies kapoho crater, so the flow would have to go around something to reach that point. It formed in ~1650 so it might be a bit unexpected for it to be so big when the magma supply was probably not really high at the time. I guess maybe it could have happened later though but I think nearly all of its lava flows have been buried by the current eruption so it might be hard to do radiocarbon dating on it now. Pu’u kaliu probably formed in its current state in several eruptions from vents in the general area, but the first and biggest one that actually created the cone most likely predates all of the pits, and could have formed after the eruption of kane nui o hamo in a similar process to the current eruption. That requires more precise dating to be sure of though. West makaopuhi could have formed in 1790? It was there in 1840 apparently but the description doesn’t really say the ’90 meter deep lava lake’ it formed was actually in the west pit and it could be that west pit actually formed in or after 1840, so this is something difficult. Really all we know is that makaopuhi and napau both formed after kane nui o hamo, and at least makaopuhi is younger than aila’au because some of the flows from aila’au (the keahou flows) have flowed over that area and would have been present in the crater if it existed then. Probably both of them are about 500 years old but west makaopuhi was rather younger. That is a good question. The first is whether the Pu’u’O’o was caused by an obstruction of by an increase in magma supply. My feeling is the former (at least as a more important contributor). The eruption had been decreasing for some time. The flows had not reached the ocean for many months. Why was this? I think the conduit was already becoming more constrained. In March something happened. I don’t think we have seen any evidence of what happened, but perhaps the flow had become so slow that at some place it solidified. As you say, Kilauea followed later As the magma backed up, pressure increased until the rift gave way. It almost caused an eruption further west so it was a close call. Why different from 2011 and 2014? First, the pressure went much higher this time, judging from the inflation. That suggests that the blockage was more severe. Perhaps the earlier episodes were from increased magma supply, with the conduits more open than they were now. The initial eruption west of Pu’uO’o was still very close to it, suggesting everything happened here. There was little excess pressure close to Kilauea (due to the open conduit?). The second effect is that this grew into a major eruption down-rift. I think the M6.9 earthquake was the cause: it created space along the rift and sucked the magma chamber of Pu’u’O’o dry. That hadn’t happened in the previous inflation events. I expect that without that event, normal service would have resumed with the eruption moving back to Pu’u’O’o. The other point is why the overlook crater had developed. It suggests to me that a decade ago, there was already a problem developing with the plumbing towards Pu’u’O’o. Rift eruptions require a minimum flow rate and pressure, as you need to keep the rift open against the rock pressure, and need to go fast enough that the magma stays liquid in the rift. 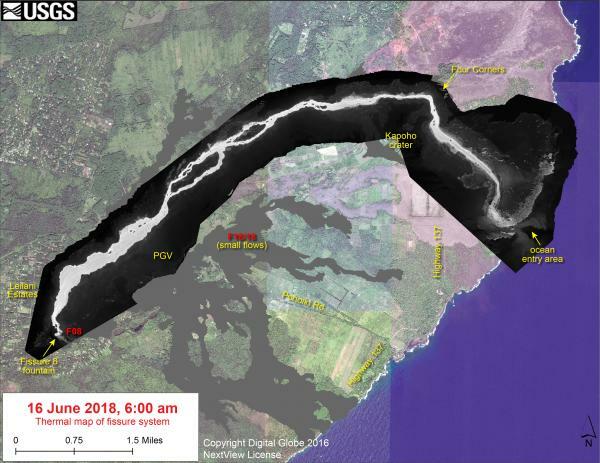 But it seems to me that the problem now was not in the Kilauea – Pu’u’O’o connection. It was in the conduit of Pu’u’O’o itself. was there any earthquake in the Pu’u’O’o area around early to mid March? I couldn’t find it just now, but I remember hearing something about how there were summit eruption precursors in 2007 that stopped without eruption, and that when lava broke out at pu’u o’o on July 21 of that year it drained everything out a lot and one of the intrusions into the summit must have become a void and started collapsing until it reached the surface 8 months later, carrying an active vent with it which became permanent after a while. After 2012 the lava lake was generally much higher, and the overflows in late April would have probably been a very significant lava fountaining paroxysmal eruption if the vent wasn’t drowned under 300 meters of lava. That intrusion in 2007 must have been relatively small and slow to not erupt or cause major quakes, but other parts must have spread along the layers as sills and dikes, leading to weaknesses in the rock and possibly also a sort of lubrication, and maybe that is why this years collapse is so wide and deep for how relatively unremarkable the level of deflation actually is. I also remember someone on here (I think it was squonk) that said the first deep Pahala earthquakes seem to start in 2010 (precursor to the kamoamoa eruption?) but get more frequent around 2014-15 (first lake overflow?) and then particularly last year when someone on here commented on it (precursor to now?). As far as I know these quakes havent stopped since then so maybe the current supply is even higher than the average and gave the illusion of nothing changing. Your ideas are probably a big part of it, but probably not quite enough to explain why this is so much bigger and such a big change to everything. Pu’u o’o was declining pretty obviously before the current eruption, but it had done the same thing in 2016 (lava struggled to get more than 5 km from the vent for almost a year then) and also way back in 2008 when everything died back to a trickle for a few weeks before resuming again with no changes. That is actually a standard security question academics get at that airport… but not the usual answer. Either this is a new vent near the highway or a massively increased output from fissure 16 or 18 (which are still weakly active). It is a bit decreased now on the next picture but still there. One of the vents further down the fissure is glowing brightly again, I think it is fissure 6. Really the numbers are a bit pointless now that most of them have ended up merging into one line. We had talked about this before on the forum but for the newer members. There is a military training range that is in use north of Mauna Loa and south west of Mauna Kea the Pohakuloa training area. Looks like they were doing live fire training recently. “File photo – U.S. Army Soldiers assigned to 25th Division Artillery, 25th Infantry Division, prepare to fire a 155 mm artillery round from an M777 howitzer in support of Operation Lightning Strike on Pohakuloa Training Area, Hawaii, May 16, 2018. Operation Lightning Strike is a combined arms live-fire exercise that increases unit interoperability and synchronization in an effort to concentrate combat power on the battlefield. (U.S. Army photo by Sgt. Ian Morales)File photo – U.S. Army Soldiers assigned to 25th Division Artillery, 25th Infantry Division, prepare to fire a 155 mm artillery round from an M777 howitzer in support of Operation Lightning Strike on Pohakuloa Training Area, Hawaii, May 16, 2018. Operation Lightning Strike is a combined arms live-fire exercise that increases unit interoperability and synchronization in an effort to concentrate combat power on the battlefield. (U.S. Army photo by Sgt. Ian Morales)” Fox news. One thing I dont get is why America has to spend so much on its military when other countries have a similar capability and active force with a fraction of the cost… Is it the same reason why it costs them 10 times as much to send astronauts to space than it costs in China? We don’t know how much China spends on its human space flight program. But the cost is always an accounting problem. In the US, NASA is a way for the government to subsidize its big defence companies. They do lots of work for NASA, and can charge whatever they want/need. No doubt that happens in China too. The US has to spend so much on its military if it wants to remain the hegemonic power. For the US the benefits of being the hegemonic power vastly outweigh the downsides. For example an awful lot of commodities are priced in dollars. That eliminates a great deal of foreign exchange risk for US companies. You also have to bear in mind that if the US were not the hegemonic power then someone else would be. For 200 years an English-speaking power has been hegemon. I believe that has been a net positive for the world. I would much rather have had the UK as hegemon than Wilhelm’s Germany. I would much rather have the US as hegemon than Stalin’s USSR or than China. Democracy has its downsides, but it vastly superior to Communism or Nazism or German militarism. That is the choice that is before the US now: does it keep leadership or does it cede it to China? If that transfer does take place then the world will end up being a very different place. The UK weren’t always angels either: see the Boer wars, fought on behalf of mining companies. China has massive problems (especially environmental) but has developed at an unbelievable pace. I believe that education is the essential ingredient for leadership. The US is falling behind in this area. Yes, its military power is an order of magnitude ahead of anyone else. But is that enough in the long term? What will happen when China’s technology outdevelops the US? Is the US playing a dangerous game by declaring economic warfare on everyone of its allies? There is no doubt that it can win those wars. But what about the peace afterwards, when everyone turns to China as the only reliable partner left? And our democracy is under threat. It has been shown that people can be influenced to vote against their own best interest or against their own moral standards. The UK government now actively argues that parliament should not have a say because it would go against public opinion. Where did we hear that one before? Anyway, politics is far more divisive than volcanoes could ever be. Turtle, where do you live? Here are two thermal maps. The recent one (top) shows that the lava now takes a different route at Kapoho. Otherwise, there are only very small changes. Going back further shows that the lava channel has become better defined over time. It won’t easily change now unless the new cone collapses, the levee collapses somewhere, or a different fissure erupts. A river delta, in piqued rock. Sorry, liquid, my tablet has an attitude problem. Quite some activity at the summit now. Starting about 6:24, USGS live cam. Looks like you missed the 5.3 by a minute. Also one of the 3.8s most likely shook Hilo. you can see some collapse of the wall in the right hand side of the live stream seconds after the 06:26 quake. Some reading from ARS Tech on a possible new source to measure earthquakes in our oceans. Operation Volcano just starting on BBC2; a two-part documentary about Nyiragongo in the Congo. With this quake, the PGcam shook and slightly shifted its vertical angle and the Leilani eruption (why not call it that if nothing else is made up) visibly chocked up a bit forming a knot in the rising fume cloud. Look at VolcanoYT rerun at around 16:26+. Looking at the photo and video chronology, is there a rotation as the caldera slumps? Lava in the river from 8 looks high right now. There is a small breakout heading from the river in the general direction of the Geothermal plant on the PG cam. Is there a poll in this post? I cannot see anything in this or the Groups A-C post. Am using Firefox. I use Firefox and can see it, sometimes other things are missing in the replies. where should I be looking? Near the title? Are the pictures clickable? How do you vote? I turned off my ad blocker and still can’t see it so it isn’t that. We’ve added two new GPS plots to the web page on Kilauea deformation ( https://volcanoes.usgs.gov/volcanoes/kilauea/monitoring_deformation.html ). Below the plots showing tiltmeter data are one-week plots showing vertical movement of the NPIT GPS station and north-south motion of the UWEV GPS station. These GPS data are collected in real time, so we get information as it happens, instead of the daily average solutions that we normally show (in the plots at the bottom of the Kilauea deformation page, for instance). The NPIT station is located right on the north rim of Halema‘uma‘u, on one of the slumping blocks (we’re frankly amazed it is still operating), and during the small explosions it suddenly drops by several meters – it has dropped nearly 90 m in total (~300 ft). UWEV is located on the northwest rim of the caldera, near HVO, and during each explosion it moves north by many centimeters. Between events, UWEV moves south, towards Halema‘uma‘u. Interestingly, the net motion of UWEV is close to zero, since the northward motion during explosions cancels out the southward motion that occurs between explosions. The dropping of NPIT, however, is permanent. Squonk do you work at HVO? Also if the net motion is almost 0 at HVO, wouldn’t that mean the deformation must be more localised to the actual collapse crater? It looked like the drop might be slowing down last time I looked so I’m not really sure now. I think the current drop is about 1.8 meters, which is substantial but not unprecedented, in 1960 the drop was 1.6 meters. Why this sort of change didn’t happen at the summit then is one of the biggest supports to my theory of this being a shallow collapse of the upper conduit to the former lava lake. Why do we have to look to FB to see this stuff and it is not on the HVO website, that I can find? HVO If you put something on FB, it should also be on your website. Because they are replying directly to questions posted. Then the questions and the answers should be posted on their website for those that do not use Farce Book. I wonder why they are saying that when there is a very important and very big difference between now and 1924. 1924 magma supply rate was extremely low and it didn’t increase until 1950. The rate now is about as high as it has ever been in historical time. I’m going to have to disagree with that particular comment, saying nothing will happen might be true of a lesser volcano, but not one which currently has the the supply rate needed to repeat this entire event in only 2 years time… Maybe they are being over cautious and comparing this a bit too much to 1924. They mentioned also that a full caldera collapse is very unlikely because the pressure there is already quite low and so the deflation might stop soon and with it the eruption will stop soon after. About 90% of the chamber is still there and untouched by this eruption, so I guess it is basically confirmed that the pathway out of the summit is not a deep system. Also the northern part of the caldera doesnt really sit above a magma chamber anyway so it would be relatively unaffected. I guess there is the possibility of the summit deflating back to the same sort of position as it was in 1960 and then stopping (if so that will be very soon), while the eruption on the rift might continue for a while longer and lead to much more subsidence along the chain of craters area than has been observed currently, which would be similar to thedustdevil’s theory. I guess it would be sort of like turning off a hose but the water still drains out, except way bigger. I dont think it can actually drain past the 1960 point because these vents are at a higher elevation than the 1960 vents so there wouldnt be any actual way for this to happen unless the eruption moves downrift again. I should clarify that ‘deeper reservoir’ is the main chamber at about 5-3 km depth, not the deep feeder system which is unaffected. I also think there is a high chance that eruptions will return to the summit. The 1924 collapse didn’t happen during a time of a very low rate but at a time of intrusions that failed to erupt, I can right now remember the 1924, 1936 and 1950 intrusions and I think all of them were massive and not the only ones, the 1950 intrusion started at the ERZ then followed the Koae Fault System and ended up in the SWRZ so doing something similar to 1973 but at a much bigger scale and the complete opposite to 1963 and also happening at the higher faults while 1963 was at the southernmost of them (the Kalanaokuaiki fault). The supply rate was not that small it just intruded and never erupted, my theory is that creating an open stable conduit at the upper ERZ, at the Puhimahu-Hiiaka section, was very difficult and took a lot of time as well as filling the ERZ with new magma. Now most intrusions erupt but the only reason for that might be that the a lot of recent magma is already filling at least the ERZ and it makes for both evolved and new magma reaching the surface more easier. What happens now? 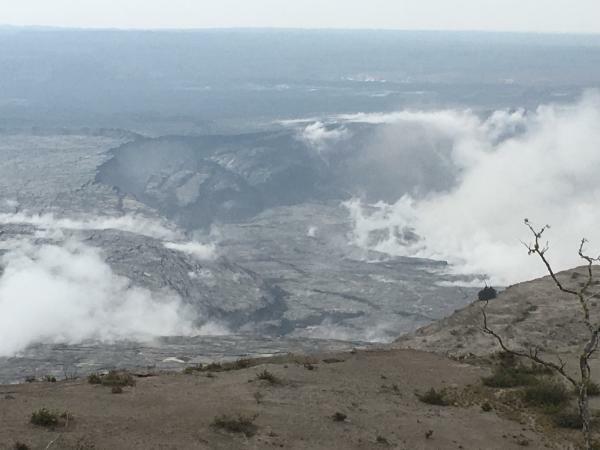 the reservoirs of the middle and upper zones are filled and there is an efficient connection summit-Pu’u’o’o and that would be more similar to 1790 which was the culmination of east rift activity at that time and was followed by intense summit eruptions with also SWRZ events. At that time the summit had collapsed more seriously than now and lava returned fast with no intrusion to the ERZ at first, then 1840 happened but this one may have been different to the ones of 1924 and after (It was unusually fast, voluminous, deep and erupted too far north). In 1790 the ERZ had been disrupted by the Lower Puna eruption but in 1924 the volcano was in the middle of a transition of activity from the summit to the ERZ. Now that is a big difference. I consider Puu Kaliu maybe bigger than 1840 or 1790 and much bigger than Puu Honualua, but this last one has a very extense flow field from what I have seen in geologic maps and I can say that it clearly looked larger than the 1960 flow. Somethig we will probably never know but a posibility is that the Puulena, Kahuwai and Pawai craters were part of the same fissure Puu Kaliu was. 1924 wasnt really that much of a low supply rate period but more like a transition of activity from the summit to the ERZ with a lot of failed big intrusions (1924, 1936,1950 and many more). My theory is that these intrusions slowly established the conduit in the Puhimahu-Hiiaka section of the upper rift zone, there was a lot of cracking at devils throat and degassing at Puhimahu. 1790 is the other past event that can be compared and I think it is the right one to choose: It was a fissure vent very close to the current one, it culminated an ERZ period of activity similar but not as large as the one preceeding the Leilani eruption and caused a collapse of the summit too. After 1790 lava returned to the summit fast and with a high rate and didnt return to the ERZ until 1840 but it wasnt really until 1955 when activity would settle there. Puu Kaliu also resembles Leilani in some ways but it is an old and not very much studied eruption so difficult to compare, I think it was larger than 1790 or 1840 and that it may have included the Puulena, Kahuwai and Pawai craters as part of the fissure but we will probably never know this for sure. Puu Honualua has a very big well exposed flow field that from what I remember clearly looked larger than the 1960 flow. The supply rate in 1924 was higher than it was for most of the 60 years preceding it, but it was still way lower than the rate now. That is why I (and also presumably you) have compared the current eruption to the 1790 eruption, because that also happened during a time of higher than average eruption rate (two eruptions of similar size in one year, probably almost 0.5 km3 total) and it only increased even more afterwards despite the huge drain and collapse that was much bigger than the current one. USGS is saying there could be a similarity to 1924 but that could be in the superficial appearance of the event, the fact that this intrusion actually erupted is a massive difference, and in 1924 the lava lake drained a long time before the east rift quakes started which indicates the intrusion was deep, slow and likely extended offshore, all of which are unlike the event now which was very fast, fairly shallow and has produced a major eruption. The 1840 intrusion was also slow, deep and quiet until the activity started. The actual onset of activity was very rapid but the intrusion was already in place. I mean, USGS are professionals but I think they are going off of 1924 because it is the only well observed comparison to this event, even if there are some major differences. This eruption is more like the 1960 eruption except with extra magma from under the east rift near pu’u o’o that makes it much bigger. I would compare 1924 to a failed attempt at repeating the 1840 eruption, with it failing because the supply was too low to get it to the surface. Both were a lot deeper than the current activity. Here is a timeline of large events at kilauea that postdate the caldera, that I am aware of. There are probably more. Obviously there are lots of intrusions we will never know about. ~1500 – caldera forms, 300 years of dominantly pyroclastic eruptions at the summit ending in ~1810. ~1500s – small lava shield eruption near current location of 1955 upper vents, vent buried by heiheiahulu. Probably similar to mauna ulu or kupaianaha. ~1650- pu’u honuaula forms, big eruption, probably similar to current eruption. ~1650-1700 – kapoho crater forms, overlying some of the lava from pu’u honuaula. Not sure if there are any lava flows associated with it that still exist. 1750 – heiheiahulu eruption, lava shield similar to pu’u o’o, probably long lived over 10 years. Most likely the biggest post-caldera flank eruption before pu’u o’o. 1790 – eruption on east rift. possibly two parallel dikes with associated double eruption. Probably similar in size to the current eruption. 1790 – largest eruption in the keanakako’i tephra series. VEI4 plinian steam driven eruption with pyroclastic flows that killed 300+ people who were near the caldera. Probably the result of a massive surge of magma into kilauea after the rift eruption earlier in the year. ~1790-1810 – series of further large eruptions that produced lava fountains in excess of 1 km high, depositing tephra outside the caldera to the southwest. Golden pumice and east pumice. 1823 – very fast eruption on the southwest rift that led to the caldera draining out and formation of a large lava flow that reached the sea. Flowed over a village and likely all its inhabitants. This eruption was probably similar to the 1977 eruption of nyiragongo. 1823-1896 – near continuous activity on the caldera floor. 1832 – small eruption on the caldera edge near kilauea iki, large intrusion into the lower east rift that ends without eruption. 1840 – very active in the caldera, then everything drains out down the still molten 1832 dike and erupts at various places on the east rift down to nanawale estates. Kilaueas biggest historical eruption before 1969. Drains out the magma system at a deep level and stops the rapid supply rate started in the 1700s. 1868 – small eruptions in kilauea iki and on the southwest rift, possible unconfirmed small eruption on the east rift. Probably intrusion into east rift. Result of the 1868 earthquake. 1877 – eruption on caldera wall between kilauea iki and keanakako’i craters. Mostly buried now. 1884 – brief eruption off coast of cape kumukahi, I’m not really sure what caused this. 1894 – overflows from halemaumau lava lake. 1912 – HVO was built. 1916 – activity returns to halemaumau after relatively infrequent activity in the preceding decade. 1918 – shallow eruption on the caldera floor in an area called ‘postal rift’. Since been buried by later flows. 1919 – overflows of halemaumau covering most of the caldera. 1919-1920 – mauna iki eruption on southwest rift. Fed at shallow depth to halemaumau and erupted quietly and mostly slowly. 1921 – halemaumau overflows again but not as extensively as in 1919. Some flows escape the caldera through a gap to the south. 1922 eruption on the east rift in makaopuhi and napau. 1923 eruption on east rift in makaopuhi and napau and downrift where pu’u o’o is now. 1924 – lava lake drains out deep and crater starts collapsing. 1924 – deep intrusion to lower east rift and puna ridge with failed eruption. 1924 – explosive eruptions at halemaumau that increase its diameter to twice what it was before. Probably driven by build up of pressure under collapsed material, vulcanian activity. One person killed by falling rock on May 18. 1924 – small eruptions at the bottom of halemaumau, lasts only a few days. 1927 – another eruption in halemaumau, lasts a few days. 1933 – slightly bigger eruption – lasts a few weeks. Kilauea goes dormant after this for 18 years. 1940s – several intrusions into the upper east rift. 1950 – deep earthquakes indicate much more magma, and intrusion into the east rift to past napau. 1952 – very big eruption at halemaumau, lava fountains taller than the crater and forms a lava lake nearly 200 meters deep and fills halemaumau half way. 1954 – small eruption in halemaumau and caldera towards kilauea iki. 1955 – large east rift eruption over the whole of the lower rift zone, lasts 3 months. First large east rift eruption since 1840. 1959 – very big eruption in kilauea iki, fills it half way with a lava lake up to 150 meters deep, lava fountains up to about 600 meters high and extensive tephra fallout to the south. Probably similar to the eruptions in the earl 19th century. Forms pu’u puai cinder cone. 1960 – eruption at the end of the 1955 vents, builds a large cinder cone with lava fountains 500 meters high. Lava buries Kapoho and Koae villages, and almost buries cape kumukahi lighthouse. Significant summit deflation of 1.6 meters at HVO, and collapses at halemaumau. Forms ‘kapoho cinder pit’. 1961 – very small eruption in halemaumau, lasts 8 hours. 1961 – another brief eruption lasting a few days. 1961 – east rift eruption, brief event lasting 4 days. Vents between kane nui o hamo and heiheiahulu. 1962 – small eruption near napau and makaopuhi. 1963 – small eruption near napau and makaopuhi. Lava lake in alae crater. 1963 – small eruption near napau and makaopuhi. 1965 – larger eruption in makaopuhi and some lava further east. Forms a lava lake in mahaopuhi. 1965 – brief eruption near napau and makaopuhi. 1967-1968 – very large eruption in halemaumau, initial lava lake gets to within 20 meters of the edge before it stops and drains. Resumes but at a lower level and makes a perched lava pond that erupts many times over the next 8 months. 1968 – eruption at makaopuhi and napau. 1968 – eruption between hi’iaka crater and kane nui o hamo. Brief eruption lasting one day with very small lava flows. Significant south flank disturbance indicating large intrusion. 1969 – eruption between pauahi crater and kane nui o hamo. 1969-1971 – mauna ulu forms. Continuous eruption. lava fountains up to 550 meters high. Fills alae and aloi craters. Lava flows to the ocean. 1971 – eruption from vents through halemaumau and towards kilauea iki, as well as the southwest rift down to past mauna iki. 1971 – eruption on the caldera fault between kilauea iki and keanakako’i craters. 1972 1974 – lava erupts at mauna ulu again after 9 months. eruptions build the lava shield up and reach the ocean again. 1973 eruptions at pauahi and hi’iaka craters, alligned with the koae faults. fissures open up to the north of mauna ulu but erupt briefly. 1974 eruptions near keanakako’i and to the east, as well as in the caldera near the 1971 vents. still liquid lava from 1968 drains out of halemaumau causing it to collapse. Lava flows on upper east rift. Mauna ulu ends at this time. 1974 – brief but very fast eruption on the southwest rift zone. Lava flows 13 km in 10 hours before the eruption stops. Seismic activity suggests there was a large intrusion towards the southwest up to the kamakaia hills. 1975 – tiny eruption north east of halemaumau following the 7.2 earthquake on the south flank. Lasts only a few hours. Nearly continuous slow intrusion into the east rift over the next 7 years. 1977 – eruption near kalalua cone in the middle east rift. Mostly small but the last 2 days were much bigger and included 300 meter lava fountains and a 12 km long lava flow that almost reached Kalapana. Formed pu’u kiai. 1979 – eruption in and near pauahi crater. Large intrusion associated with the eruption. 1980 – very tiny eruption near mauna ulu. large intrusion into middle east rift. 1980-1982 – many intrusions into upper east and southwest rifts. 1982 – eruption in halemaumau and the caldera towards kilauea iki. Visible for 1 day but continued at a very low level for about another week. 1982 – eruption on caldera fault between the 1974 vents. lasted just over 1 day. 1983 – 1986 – pu’u o’o forms. 48 episodes of high lava fountains build a 250 meter high cinder cone. Lava flows up to 14 km long but no ocean entry. 1986-1992 – kupaianaha shield forms 3 km downrift of pu’u o’o. no fountaining but forms a lava lake and a lava shield the same size as mauna ulu but not as tall. Lava flows to the sea many times, destroys Kalapana in 1990. Lava in pu’u o’o but not erupting. 1991 – eruption between kupaianaha and pu’u o’o, lava flows into royal gardens subdivision. Kupaianaha continues erupting but at much reduced level and dies in 1992. 1992-1997 – fissures on the west side of pu’u o’o, lava buries most of the west side of the cone in a new shield. Lava flow to the ocean many times. 1997 – eruption between pu’u o’o and napau. Lasts just under a day and includes major collapses of pu’u o’o cone. 1997-2007 – eruption at pu’u o’o on the west side again, with lava flows to the sea almost continuously from several different vents. 2007 – tiny eruption on the north side of kane nui o hamo. Large intrusion associated with this eruption. Pu’u o’o collapses again, no eruptions for a month. 2007-2011 – pu’u o’o refills and lava breaks out between it and kupaianaha again. Eruption for 4 years with lava burying most of kupaianaha and flowing into kalapana again. 2008 – pit appears in halemaumau and lava erupts in it. Large lava lake for the next 10 years. 2011 – eruption between napau and pu’u o’o. Lasts 4 days and lava flows south of the rift. Pu’u o’o collapses again. 2011 – pu’u o’o refills with a lava lake and then breaks out with a very large fast flow to the southwest. Eruption doesnt sustain and stops for 2 weeks. 2011-2018 – pu’u o’o refills and lava erupts on the east flank. 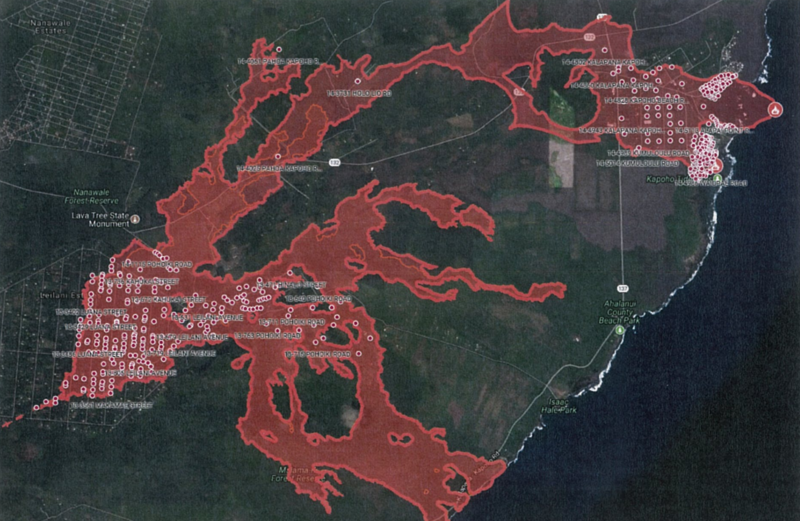 Lava flows to the ocean less frequently and flows as far as pahoa 25 km away. 2015 – eruption in halemaumau. lava overflows the pit. 2018 – larger eruption at halemaumau, lava covers most of the crater floor. 2018 – very large eruption on lower east rift inside Leilani estates and Lanipuna subdivision. Lava flows to the ocean several times. Large cinder cone formed that has yet to be named, flows from this cone destroy Kapoho 13 km away and enter the ocean. Biggest lower rift eruption since 1840. Still ongoing. The observatory flows and shield marked the end of the Uwekahuna ash at 1000-1100 years ago? overflowed the caldera and built a shield on the summit area, it probably extended all the way to the next large caldera in 1500? Kane Nui o Hamo was the main event of this time at the ERZ building a large shield and flow field comparable in size to Pu’u’o’o and formed somewhere between 1250 and 1500 I would say and based in radiodarbon dating, Puu Kaliu is of a similar age and formed at Lower Puna building the probably largest exposed pyroclastic cone between Pu’u’o’o and the Kapoho crater with a mean height of ~80 m the flows are only exposed to the south and are commonly 15 meters thick or more the Malama fissure (Puulena, Pawai, Kahuwai) formed at a separate event close in time or at the same erution as Puu Kaliu. There is another flow dated ~490 years BP I dont know much about. Ai Lauu was a shield that formed at Kilauea Iki and launched large flows into the ocean to the east, I dont know why it formed or when exactly but if it formed just before the 1500 caldera then I theorise that it happened when the observatory shield reached a large size that caused the magma to break out at the closeby rift area at Kilauea Iki moving the main vent there. These are events that happened after the caldera formed. As such I didnt include any of those events except the one that happened near pu’u kaliu. I think originally pu’u kaliu was probably not much bigger than the current cone but that second eruption covered it over with more tephra and increased its height a lot. This is sort of hard to prove though unless someone has done some study on the cone itself. 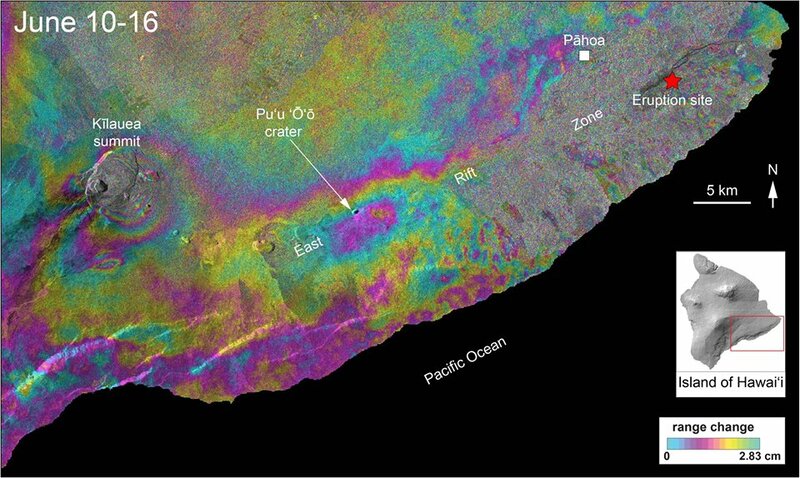 I noticed that the faults south of the aila’au shield actually go at an angle to the orientation of kilauea iki, so the initial eruptions from aila’au probably happened along a northeast/southwest trending fissure that erupted as a significant fountain, as scoria is present at the base of the cone. The dike could have gone north from the keanakako’i area initially. This must have been quite a shock to the people downhill as that area probably wasnt affected by lava flows for a long time before. The first flows would have been quite big too if the eruption was a fountaining vent, so quite different than would be expected from its later appearance. Faults at an angle to Kilauea Iki? are you talking about the caldera-associated faults because if that is the case I think those faults are more recent than Ai laau and that the eruptions must have happened through fissures of the Kilauea Iki alignment that as all eruptive fissures of the SWRZ, ERZ and Koae Fault System is oriented in a more or less perpendicular direction to the Hilina Slump. I do think that the concentric faults of the summit may play a role in the transport and storage of magma as Keanakako and Puhimahu are close to them. No I mean faults parallel to the koae fault zone, in line with the 1974 vents. Kilauea iki didn’t exist back then and neither did the caldera, and apparently the earlier caldera was smaller than this one so the ring faults for that would be gone now. The direction of extension in that area is south and east, and the majority of fissures, both eruptive and non eruptive, are along this line. the 1868 and 1959 vents are exceptions to this but they formed because kilauea iki changed the local stress field. Aila’au wouldn’t have been a radial fissure to the observatory vent, it would have been at a weird angle almost 45 degrees out, and probably only became more centralized as the feeder to it became bigger and more open, probably leading to less organised shallow vents making the shield symmetrical. At the time it formed, that area could have been a lot lower down so the flows from this initial stage are deep under the later lava. There hasnt been a lot of major southwards spreading where aila’au is now because the caldera faults carry a lot of it. When the caldera eventually fills entirely (probably some point in the next 150 years) then this will probably change and eruptions might start happening where aila’au is again, outside kilauea iki and north of the east rift proper. This is speculation at the moment though and it has to fill in the massive hole formed in the last month first. At 0.2 km3/year it will take a minimum of about 5 years to fill but 10-15 years is much more optimistic. However if things go crazy it might happen much faster than expected and the eruptions might be way bigger too, as happened in 1790. HVO might have to be relocated to the far side of the caldera if this happens. I uploaded this picture on another page but I updated it. Red is historical vents, blue is prehistoric still exposed vents. Orange is an area with post-1790 spatter along it. Green is the koae fault zone and non-eruptive fissures along that trend. Yellow is the caldera faults outside the actual caldera. Purple is the caldera pit. Black is the rough outline of the current crater. The thing I am talking about with the initial aila’au fissure is the brown line. The initial eruption probably happened in this direction and maybe in an area without history of eruptions in recent time, so it must have been quite a memorable event for whoever was there. That is a very interesting posibility but if the faults around Ai laau are buried there wouldnt be any way to know that for sure. The yellow ring faults outside of the actual caldera explain why HVO wisely moved their operations to other facilities. The movement of the NPIT station illustrates this quite well. Also the most recent pictures of of the summit almost look like a glacier of rock, all the crevasses as the slumping areas flow towards the now much smaller deep pit. HVO has officially said the total volume of the collapse is 0.26 km3, or a little bit bigger than the eruption volume, which is interesting regarding the analysis Albert did on the pu’u o’o deformation indicating less magma moving in than leaving so that magma must be getting stuck somewhere or maybe in a small passive intrusion near pu’u o’o created by the big quake on May 4th. Maybe HVO didn’t include the volume of pre-collapse halemaumau in that and the new volume that has been created in this collapse is smaller. I dont think the crater is going to get a lot bigger either as the deflation looks like it has largely stopped (still to early to say for sure though). In any case if eruption resumes at the same rate of supply then this entire new crater will be filled in less than 2 years, I find quite incredible that something as big as this could potentially be so short lived. It probably wont actually be that fast but you never know with future events. I still dont see why the slower linear fall at Pu’u’o’o means no magma from the summit coming in. CRIM keeps falling at the same rate and OUTL just slowed a little, did HOVL fall? I never said it means no magma from the summit is going to the eruption, I meant that not as much is getting there to be the cause of the eruption rate observed. This either means the magma just isn’t leaving the summit at a high rate, or it is mostly going somewhere else. I dont know if enough space was created by the quake to account for this so I’m going to assume the summit is draining slower than the eruption rate and as the deflation at the summit seems to be slowing now at uwekahuna I’m also guessing everything might start slowing down a lot very soon, it has been going at this rate for over 3 weeks now and as the summit GPS is looking like it has clustered at the same spot for a while and pu’u o’o might be deflating less too. HVO is doing an excellent job in providing public information. And that at a time when they have no base and are extremely busy. They have added new information on the web site, such as the real-time GPS, the real-time video, and seem always happy to answer questions. Hats off to them. Yes, there is a bit of an issue that they use different media and the information is not disseminated simultaneously across the different streams. But that is something we haven’t solved yet at VC either -it is unbelievably time consuming to do so. That has to be legit for sure! Also, let’s not forget a certain unidentified underwater mud volcano off the coast of Gothenburg. Go Sweden! I pointed out that Australia was very underrepresented with the neglection of the borderline flood basalt eruptions at the mcbride field in Queensland. It is not known exactly why there are active volcaneos there at all but the source is very robust and doesn’t seem to be hotspot derived because eruption have been happening there for over 25 million years after the hotspot was there without completely stopping, and has increased significantly in the past 2 million years. It will erupt within the next 5000 years. Am I the only one getting buffering on the live feed? Since it only happens when it is dark, I guess they turn something off? Fissure 6 is playing up. It looks like it has a small fountain now, spatter jetting into the air about 30-50 meters. No lava flow but it is something. If this vent takes the supply back then the lava will probably flow back to the south into the ocean on the old channel, but given that the main vent is uprift of it this is unlikely. I am wondering whether it is a short lava flow coming towards the camera. There is often a light source to the right of fissure 6 as well, although not in the frame you extracted. HVO confirmed it now, there is a spatter cone forming there. I think the same sort of thing is happening further downrift at fissure 18 and either 17 or 16. All of these are building little lava shields with very small flows. Nothing uprift of fissure 8 though, at least not yet. It may be relative small, and it may have been something fully expected, but I just want to remind everyone that what you are seeing is the business end of a flood basalt. The stuff you are seeing is pretty much how the Columbia flood basalts behaved when they made it to the surface. Some of those flows ran for miles across Washington state before making ocean entry. The only real difference is scale. Shallow earthquake activity west of highway 130. If it erupts now then it could be the first time in recorded history where two galapagos volcanoes are erupting simultaneously. Actually piton de la fournaise, kilauea, erta ale, fernandina and pacaya are all erupting right now, meaning there are 5 simultaneous effusive basalt eruptions going on. I dont think this happens very often. Piton stopped erupting last week. Steam picking up at the summit and a little of tremor on some of the instruments. M 5.3 16:12:48 same spot as before. I guess I was typing while the event was happening. I did not notice as much ash compared to yesterdays event. Right, more white, steamy clouds. I did search back for the quake moment. There is some kind of railing in the lower right of the cams viewingfield. You can see it shaking during the quake. The NPIT GPS seem to have stuck were it was this time! And NPIT seems to have lost signal – poor thing: will this be its end? Where do you look at the event and tell which direction the initial jolt was? The tilt on the plot at the time of the quake shows a line that goes down and up. The previous one(s) did not have the down-part of the line. And NPIT still has not come back on-line. Is it time for the NPIT wake? I have had the Kilauea summit stream on for a while, and I notice quite a number of birds flying around in all that steam, pungent sulphur aromas and nice throat-scratching ash clouds. Any thoughts on what species they are and what they are doing all the way down there? I was wondering if all the activity stirs up insects for them to catch. I noticed that too, odd looking isn’t it? White, but they come not close enough to recognize a silhouet. The way they fly makes think of see birds, some kind of gull maybe. There are insects, visible as they fly by the cam. There are no (or few) gulls on Hawaii. Gulls go for shallow water and the cost is too steep for them. (And there is no bird called ‘sea gull’, by the way.) The main similar bird in Hawaii is probably the red-footed booby. I differ in opinion. I’ve stood deck watch at midnight too many times watching their behavior at dumpsters. They are rats… and at times, the only entertainment while you wait for the other watches to check-in. No they are ocean crows. The gulls here have quite a nasty reputation. They get pretty big and can be quite aggressive if you have food on the beach or you get too close to their nest. I watch them a lot and there are a few pairs nesting on nearby roofs. They are great parents. I like them, I think they are very underrated birds. Opportunistic omnivores, a bit like us humans. They are noisy and annoying but I sure missed them when I lived inland. Actually, as a serious thought, if dinosaurs shared the same respiratory system as birds (we know at least theropods and sauropods did), that would make them more susceptible to being poisoned by atmospheric conditions than a mammal of the same size. The chixulub impact happened on a thick evaporite deposit, so it’s impact would have created a lot of gaseous sulfur compounds and also a massive amount of chlorine. The massive amount of energy released (bigger than every volcanic eruption combined since then) probably would have ionised a lot of air too creating conditions for nitrogen and oxygen to react and so you get a lot of dangerous and highly oxidising chemicals in the air. This will kill everything of course but birds with their sensitive respiratory systems would be the first to go. Back then there was a lot more ‘birds’ so yeah… This is just from the impact too, the Deccan traps would have done most of this regardless of the impact (except the air ionisation part). As far as I know no-one at all has considered this when looking at why the extinction was so devastating to the dinosaurs when a number of other animals were relatively well off. Advanced mammals and squamates survived fairly unaffected with many modern mammal lineages evolving in the late cretaceous, including our own, while only one group of dinosaurs, the neornithes (what we now call birds), survived the extinction event and apparently almost didn’t make it too which is why birds are extremely conservative with the design of their skeleton. The survival of the birds is one of the mysteries of the KT extinction. They are rather fragile and survive mainly because of an ability to flee danger and travel around for food. Neither of this would have bene helpful against the shockwave of the impact. The size would have helped: every land animal larger than a dog went extinct, and the survivors were the small ones, often nocturnal or hiding underground. Crocodiles survived too – no surprise there. But perhaps what saved birds was their ability to fly long distance, not during the event but afterwards. If the extinction was not quite global, birds could have survived on a less affected oceanic island and escaped from there. Any dinosaur surviving there would have been stuck and gone when the island sank – as they all do. Or, perhaps large temperature fluctuations were lethal, and some birds were able to stay ahead of the weather. I don’t think the skeleton design has anything to do with it. That is purely an optimization for flying. The thing about that is that pterosaurs could do that too, arguably better than birds because of their often much larger size, and they still went extinct. Enantiornithine birds were also just as capable fliers as the ancestors of existing birds and were much more successful at the time, including forms as big as large eagles and with a wide variety of them having teeth (basically flying velociraptors), on the other hand they were also sometimes no bigger than neornithine birds. All of these also went extinct. I remember reading something about most neornitines being somehow partly aquatic in freshwater habitats, like ducks now (ducks actually survived the extinction) so maybe that had something to do with it. Maybe it was sort of accidental, and apparently birds were not too diverse for the first 10 million years of the cenozoic because bats exploded in diversity then, and bats are not known to have a mesozoic representative so their evolution must have been very fast and with little competition. A lot of aquatic an ocean going birds are known from this time though. I was wondering the same thing. From the way they are using the thermals I would guess that they are some kind of raptor. There does seem to be a lot of insects in the vicinity of the webcam. and considering that the birds we can see on the webcam are clearly pretty large and have white wings, I suggest that they are possibly Stellar Sea-eagles. All the other largish white-ish birds are seabirds designed for diving, not soaring, and I wouldn’t expect to find them at the top of the volcano. Sea eagles would be less likely (make that unlikely: they don’t occur there). But I have seen tropic birds around Kilauea and they are large, gull-like and white. Ok we have around 1-2 hours for the next bang. Hoping that Pele will wait until the sun comes up. Just looked and we have earthquakes every 2-3 min. The biggest river in hawaii flowing into the ocean about an hour ago. Assuming an average of 7.5 million m3 per day since it started erupting big, fissure 8 has erupted 172 million m3 of lava, or 0.17 km3. With the extra 60+ million m3 erupted by other fissures before that after May 17, and the ~8 million in the initial stages, this eruption is now 0.24 km3. This is bigger than the 1955 and 1960 eruptions combined and bigger than most estimates I have seen for the volume of the 1840 eruption, meaning it is now kilaueas 3rd biggest observed eruption in recorded history. It might still be smaller than the 1790 eruption but not by much. Alarming how much lava is pouring as one down the slope under the sea. Local tsunami risk do you think? As the silts and sediments on the covered undersea slopes get overlain with lots of heavy cooling rock. I would not feel safe near the shore especially in a small boat. Most of the new land has formed over the very shallow coastal water, and the flow of lava into the ocean is much higher than on the 61g ocean entry so the lava probably just flows underwater relatively unimpeded. There is an upwelling zone some distance offshore from the lava flow advancing underwater. There would be a very local tsunami risk, but a very local tsunami caused by a small landslide is the same as a big normal wave… The waves at the surf beaches around Hawaii are probably bigger than anything that will form from the lava delta collapsing. Thank you, I see the picture more clearly now. There are several moments there when steam explosions happen in the sea right next to the entry, that would be lava flowing underwater but not reaching very far from there. The upwelling HVO was talking about wasnt static and probably had to do with masses of hot water transported far away by the surface ocean currents or to normal sea water upwelling next to places were brownish dense cooled water sinks and not underwater flows. Bigger yes, but they do not penetrate into the interior. well the bang happened but in the dark as far as i can tell, in the dark…. Looking at the streaming Kilauea cam and I see a red light on the right side and behind the crater? Maybe an artifact in the camera with its sensitivity turned up? If you go back on the live cam to around 05:29:35 you can see it start to flicker, then 05:31 it is more constant. Do they use lasers out in the field to measure distance? Dunno for sure, but laser rangefinders certainly are in the bag-o-tricks that the USGS uses. They were employed at Mt St Helen prior to the flank collapse. I even use a small handheld one to estimate cable needed for network installations. …which reminds me of something I saw at the local jail while working Shore Patrol/Navy Police years ago. I was filling out paperwork to take custody of a sailor at the receiving desk and evidently they had not done a full search of one of the other detainees who still had possession of her wig. She threw it down the hallway in front of the cells and it slid along the floor like a giant furry critter. An officer was walking out to the hallway as this wig slid past. Scared the $@#$ out of him. He,, err, “wigged out” ? same affect can be reached with balled up black sock. ask my hubby. (no, it wasn’t me he scared…. he wants to live longer) i’m not one of those women who stand on a chair and scream… i pack the chair and move. i’m in charge of killing spiders, tho…. They just put up an quake. USGS lists this as an eruption, not a quake. All of the eruptions have been M5.3. I am confused with this, but I think I know why. It looks like the smaller “4 events” don’t get the same type of review as the larger “5+” events. All of the 5’s are shown as Volcanic events (with beach balls) where the 4’s in the summit area don’t have a description or a beach ball for the events. Here is a 4 that occurred where most of the 5s where. I think it boils down to the moment tensor solution. An explosive event will be non-double couple. Meaning there will be no extensive or compressive quadrants. All quadrants will be the same. (likely compressive). This is derived from the first motions detected by the installed seismic array. Using an accelerometer, I’ve looked at this with a 20kg mass dropped onto the ground 10 meters away. I showed negative first motions on the readout no matter how the “experiment” was arranged. An explosion, of course, would generate positive first motions all the way around. I couldn’t check that since local ordinance forbids me detonating fireworks. Hmm, I just noticed that the M5.4 has the tensor solution and not the 4.1. I’ve seen in the past that USGS doesn’t always release a moment tensor for smaller events. (Saw this a LOT during the Guy Arkansas swarm). Since the 5.4 has a tensor, odds are that there was some sort of failure mode evident in the eruption waveform. Probably a collapsing block since the beach ball shows normal mode faulting. They are giving us something to puzzle over. If the 5.3’s are caused by a large block falling, then what causes the large blocks to fall with such regularity in size and frequency? I won’t even attempt to ask how the effects of the blast work out a sequence of consequences from the strange tilt chart to Rob’s observation (below), to momentarily choking off the gas plume at fissure 8, if that indeed is what I saw. Normal mode faulting would suggest the collapse is caused by slumping into the drained conduit that fed the lava lake. The onset of wider collapse could have been when the lava level subsided to about 1 km deep and the blocks are sliding at an average of a bit over 45 degrees. Some of the sliding could be due to lubrication from lava in shallow sills under some of the caldera, particularly to the southwest where it is known there is a shallow connection between halemaumau and the southwest rift. Back in May when the first evidence of wider collapse was obvious, I said the collapse looked more like the rock was sliding towards the deep pit, and now I have confirmation on that idea. That also makes it extremely unlikely that there will be a caldera collapse on the full scale, despite the size of this eruption. The amount of visible collapse is huge, but the amount of actual deflation measured at HVO is only about 20% more than in 1960 (1.6 meters vs ~2 meters). The eruption on the other hand is more than twice as big as 1960 so a lot of the magma must be sourced from elsewhere. I think that was a period where the flow rate seemed to have diminished a bit but later comments on FB say that rate picked back up again shortly afterwards. Maybe it has a relation with the by the Puu Oo radial tiltmeter measured ‘disturbances’. Few days ago Albert mentioned a possible precursor for a larger earthquake. Looking at the USGS graph today shows again the same disturbances, but in a different sequence with the quakes. Speculation: the explosions causing the earthquakes are sending magma pulses through the rift. This speculation ruled out, the pulsation may be a sign of a nearby pressure equilibrium. But when I recall correctly, the disturbance was measured at PuuOo some weeks ago already … since then nothing much changed eruptionwise. 2018-06-20 00:24:19	4.4	4.6 South of Puu Oo. With the gaping hole in the area, and most likely magma moving through the area, I think it will be settling for a while. Might be a kink in the plumbing that has to clear every so often with the settling in the area. They are mostly between 3 and 7am. Never in the afternoon. I graphed EQ > 4.5 UTC time of day for just Kilauea. It is at http://www.greghorne.net/LEW/30DayGT4Point5.htm if you are interested. Four of the dates are in my range. Two match and two do not. I did not know if the 12s were am or pm at the time. I will check them now. Joshua Burbank on facebook posted this video of a lava bomb in the ocean. He actually called it a lava berg said it was as big as a van. Apologies meant to add this is from the eruption in Hawaii this week. Next post is up. Did you hear the one about Belgian volcanoes?